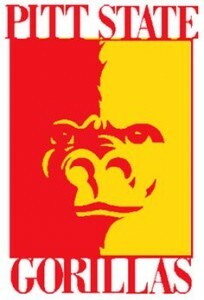 Logo of a Division II college football team that plays in the Mid-America Intercollegiate Athletics Association, the Pittsburg State Gorillas. The program came into existence in 1908 and has been highly successful, boasting a .663 winning percentage and an undefeated (3-0) bowl record. The Gorillas, who have claimed 4 small college national championships over the years, have sent a few alumni on to pro football careers, including Eldon Danenhauer, Ronald Moore, Troy Wilson, Brian Moorman, Kendall Gannon and John Brown.